Goodreads: Avery is a seventeen-year-old girl whose reality has just been shattered by the death of her mother. Feeling a desperate need to flee from what has become her life, she follows a travel plan meant for her mom that leads her to the little beach town where her mom grew up. It's there that she meets a group of three adventurous friends who adopt her into their circle, allowing her to experience a summer she never thought would be possible after suffering such a great loss. Unfortunately, her summer full of experiences threatens to end abruptly when she realizes that one of the three has a secret that causes her to question everything about the new life she has been building. 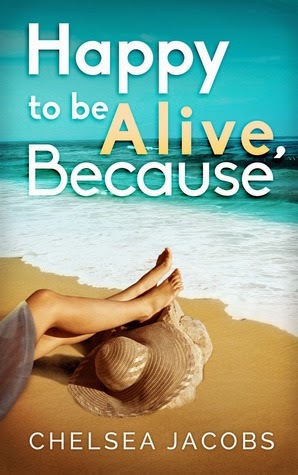 Avery must learn to balance her grief and her desire for a future in order to achieve her mother's final wish for her: That she would be happy to be alive. Kritters Thoughts: Avery was a great character, I loved her age and the point of life that she was in - trying to figure out what her next move will be and all without a parent. I was amazed that she left home so quickly on this adventure that her mom had planned out for her - amazed and kind of excited to follow her! Avery was an honest character and I appreciated her true reactions to her mother's death and that there were ups and downs through her entire grieving process. I loved her hesitation with people, but her complete openness with others, I understood her. The secondary characters were fantastic - they completely added to the story and didn't take too much focus away from the central storyline. The twists at the end were absolutely satisfying, I was beyond excited about what the author left to unveil and how she wrapped it all up. I hesitated for a moment and debated about labeling this a perfect YA read, but there were just a few moments that were a little questionable in adult matters and I like to label my YA reads when they are completely on the innocent side. If you are willing to read and approve this for your young YA reader, than I would recommend this one. Thank you so much for taking the time to read and review this--I very much appreciate it! Absolutely! I loved it and passed it on to my mom who is a blogger and will maybe love it even more! Thanks for your review and thanks for passing the book on to me! !